“Evening to everyone connected to Daventry Town FC. This Saturday see Daventry Town FC play our penultimate home game of the season against Peterborough Northern Star. The club is on a high after last weekend’s season defining results which saw the Town battling back from 1 nil down at halftime beating Holbeach 2-1, taking the points and maintaining the unbeaten away record. With the shock results of both 2nd placed Deeping Rangers losing 4-1 to ON Chenecks and pre-season favourites Rugby Town losing 1 nil at home to Cogenhoe, ending their chances of the title. This means the Town are now 9 points clear of Deeping with 4 matches to play. An incredible achievement with our limited resources. Looking back 3 weeks before 2016/ 2017 season, the club had no manager and team in place. The joint appointment of Arron Parkinson and Andy Marks set the club off on to the next chapter in the club’s rich history, winning the Division 1 title that year. Unfortunately, Andy Marks stepped down due to work commitments, but I’m glad to still see him at the club supporting the team. Ian King joined Parky at the helm and a crack at the UCL Premier Division, lightning doesn’t strike twice and we had to settle for tenth. 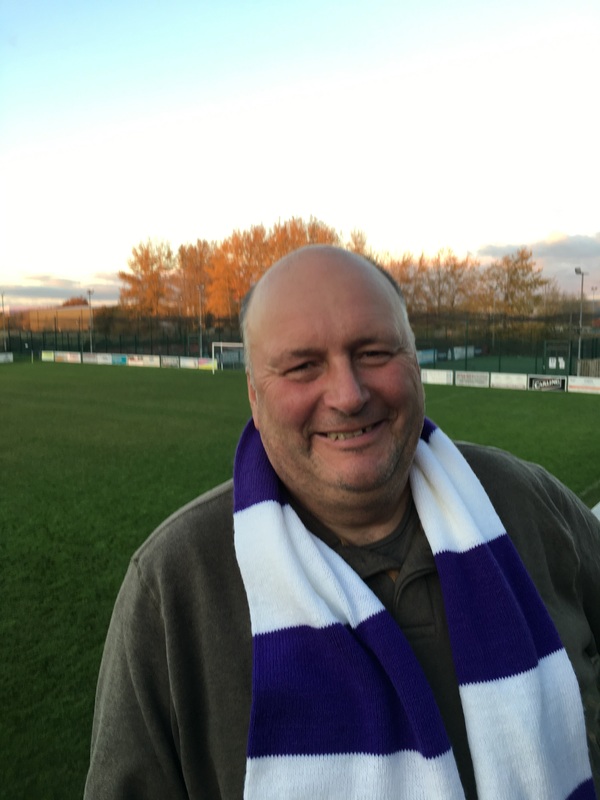 It gives me great pleasure having lived in Daventry for the past 50 years, and that togetherness of the Daventry Town FC family, plus the First Team that Parky has assembled is all paying off and giving the supporters and the population of Daventry something to shout about again. So why not come along this Saturday and cheer on the lads. This season is rapidly approaching it’s end to an exciting conclusion with the First Team potentially winning the United Counties League Premier Division title on Saturday. We welcome Peterborough Northern Star FC, to Elderstubbs, for a 3pm kick-off and if we achieve a better result than second placed Deeping Rangers FC, then the title is ours. Even if we both win our matches, we have a better goal difference of 25 goals, so that would leave 3 matches and a 9 point lead, that would take an amazing string of results to turn it around. Incidentally, Town have the best away record in Non League Football and at Step 6 having won 16 matches and drawn just 1 match. We are also in the top 5 points gained overall which just goes to show what an impressive array of talent our Manager, Arron Parkinson, has put together and in only 3 seasons. The Junior Section of the club as always, you and your family are invited to come along on Saturday free of charge, and hopefully help cheer the boys over the line. The club has decided to extend the courtesy of free entry to the Junior admission as we feel the Daventry community should enjoy tomorrow’s event and join in the possible celebrations afterwards. We have two remaining away matches and we would like the supporters of the club to join us and we hope to run a coach to both these of these games. Please email club.secretary@dtfc.co.uk of your interest to travel with us. Town have also had the fortune of winning the double as Parky’s men face Holbeach United in the UCL Cup Final, at Raunds Town FC, on May 6th which is the Bank Holiday Monday. But why should I stop there, I have more to shout about as well, as this is also the first year for our Reserves and it has been a massive delight to all the committee. We have had players breaking through from the Juniors into the Reserves due to the ethos of the club and Andy Emery has built a team which all about youth ethos with the average age well under 20. Parky is also not afraid to bring through younger players and I don’t think it will be long before players coming through the Junior ranks will make their first team appearances. It might be a while away for these junior lads, but some players have already made a very good start to their Daventry Town FC careers. Gary Reading’s U-8 Vikings have secured a NYDAL Cup Final place on May 18th. Also to be congratulated are Stuart Cleaver’s U-13’s Vikings who have won the NYDAL C League title, only losing one match throughout the season. Our friends, Coventry United LFC are also nearing a successful conclusion to their season and are also looking for promotion. Likewise, they invite you all to come along and watch their home matches for free. A really enjoyable season culminating in an amazing achievement by all players and staff. Well done Town!